And just like that, fall was out the door and winter came rushing right in. It’s funny to me that Lydia and I shot these photos only just a few weeks ago, when the temps were brisk enough to warrant a sweater and boots — only to look outside my window today to see melting snow everywhere. Dear New York gods — what’s the big idea?! Can’t you let a girl enjoy her new fall staples just a little longer without having to worry about sidewalk salt ruining half of them?! This week has been a whirlwind, but I’m starting to feel like a broken record when I say that — every week for the rest of the foreseeable 2018 will likely feel like a whirlwind. We got back from Madrid Tuesday night and I was slammed with deadlines the minute I set foot in my apartment. Definitely not complaining — busy is my happy place — but with the holidays practically here and another trip coming up this weekend (to Vancouver! ), I’m already trying to figure out ways to pull all-nighters again. Spoiler alert: Grandma can’t hang. So I’ll be enjoying some much needed downtime and catch up this weekend, before I pack my bags again on Sunday. If I have any Vancouver locals reading — send me your recs! I’ve only been to town once before so I’m excited to be back! A legend interviewing a legend. Doesn’t get much better than that. And let’s also talk about Michelle’s killer white dress, corset belt combo that’s basically giving me LIFE. I’m taking notes, are you? Loved Grace’s post about knowing your limits and your partner’s limits to social sharing. Definitely can relate! A great roundup of all the ways you can help out the families and firefighters in California right now. SIX // Loved this two-piece set on Mary! Excuse me while I add to my online shopping cart. Are you guys following her yet? She’s among the wave of new Congress members joining in January and she’s officially the youngest too — 29! Her Insta Stories have been so eye-opening to the whole process of joining Congress and what seemingly happens behind the heavy curtain. Here’s the quick run down: she’s a dog groomer who films her clients in slow motion, set to music. Pure gold that is guaranteed to make you smile. Why didn’t I think of this?! 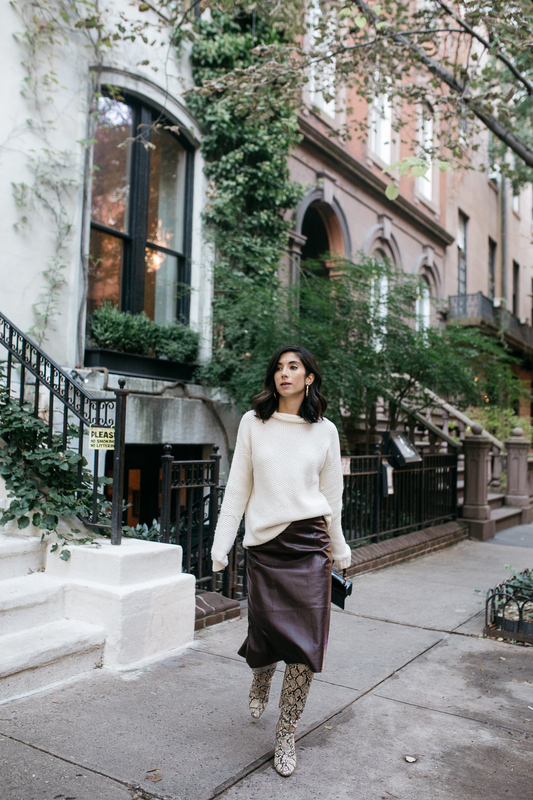 Style and fall outfits, friday favorites, sezane. Those boots are FAN-TAS-TIC! And I’m with you … I want/need a little more time to enjoy fall before winter hits.